Her feet, covered only in thin stockings, are numb to the cold. The snow crunches with each step taken and still, she carries on. They will not break her. Their punishment cruel, a test of endurance that she must bear if she is to become one of them. 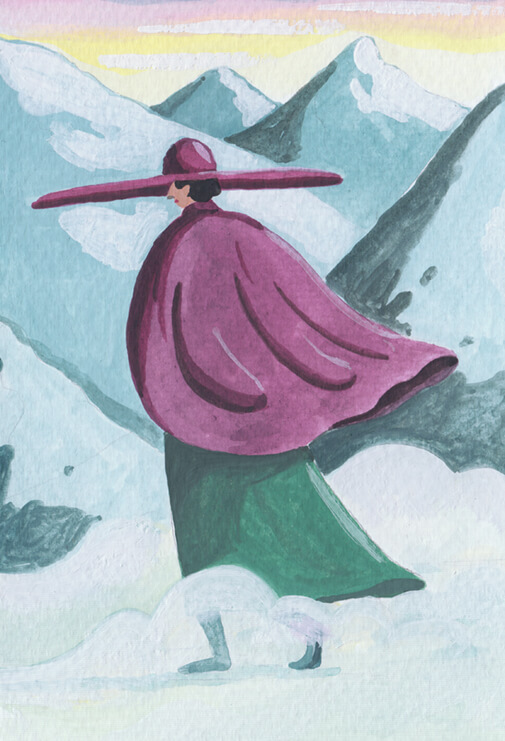 The broad rimmed damson-coloured hat blocks out the view but she knows where her travels will take her. She does not need to see the snowed capped mountains to know her destination. It’s a test. A way for them to determine if she is strong enough in both body and mind to join their coven. No magic is allowed as she trudges blindly onwards. Her body, now accustomed to the harsh north winds that rip around her, knows not to give up, not to give in. Her matching damson cloak puffs out behind her as the wind catches it, causing her to stumble, but she will not fall. Hands clenched tightly and snuggled close, she senses her way to the cave. She may not be able to see, but her mind memorised the way, the standing rocks a guide on her path. The wind howls around her. “You won’t break me,” she shouts, tugging at the cloak, pulling it as tight as possible. The urge to use magic to heat her body is a torture in itself, but she holds out. “You can do it. You can do it.” She recites the mantra over and over, willing herself on. She recalls her grandmother’s tales of the coven. Her family, she’d called them. Witches of the highest order, the ones who controlled everything. They weren’t hard to find, but becoming one of them was something entirely different. Their cruelty was known throughout the lands and even though her grandmother had prepared her well, she struggled. Her legs tremble, her eyes beg for sight. Is this even worth it? she thinks. Do I need to be part of their coven? I could create my own, make it a safe haven for witches like me. She sighs deeply, knowing that would never happen. A bird squawks overhead and her heart thumps. “Almost there,” she whispers. One final hurdle to go. Her grandmother had warned her, “If you hear the bird squawk, don’t look up. Count to twenty and lie on the ground. Wait another thirty seconds and then continue on.” She’d asked her grandmother why, but she refused to answer. “Just heed my warning,” she’d said. "Fifteen, sixteen, seventeen, eighteen, nineteen, twenty." She throws herself on the ground, the snow coating her clothes as her body sinks. The wet seeps into her as she waits, counting to thirty in her head. At twenty seconds, she feel something rush past her. She doesn’t dare raise her head. At thirty she pulls herself up and continues. The cave isn’t much further and once inside she’ll become one of them. She’ll have passed their test.